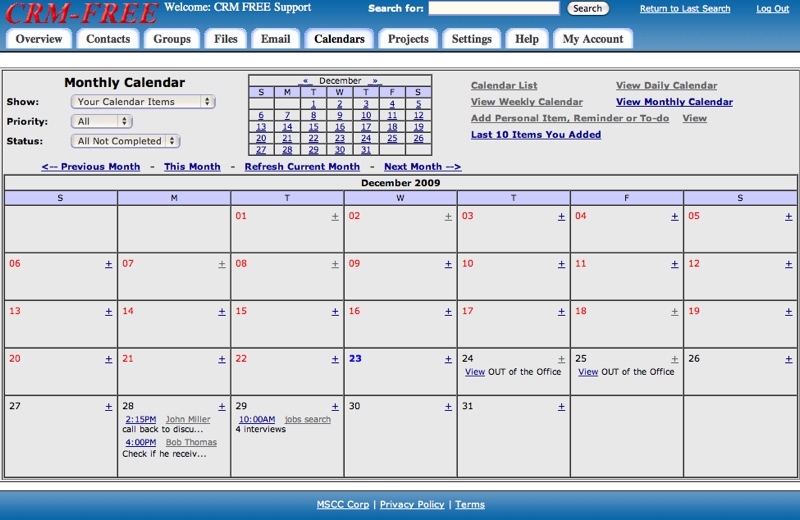 CRM FREE calendars allow you to view daily, weekly or monthly calendars of your activities or events or those of others users. Share your calendar online with other users. You can also view a list of calendar items. On your monthly calendar you can see all items for the day. Clicking on the time or View link you will see the complete details of the item and if it is linked to a contact or project you can click on the name to go to the contact's record or project's page. Easily add a personal item to any day by clicking on the + link in the appropriate day. In the upper right you also have links to a list view of your personal items, reminders or to-do's and can see the last 10 calendar items you added.